because of its boasting pristine waters and beautiful white sand beaches. This makes this place famous worldwide. Mactan is a great option for an exceptional vacation whether on a long stay or just a day tour experience. One of the top activities that everyone loves to embrace in this place is the island hopping tours! Why? Because of the famous beach destinations here. There’s nothing more fun than a day spent on the beach and be on board on a private tour exploring the islands. When exploring the islands around Mactan, a 6-hour island-hopping excursion and snorkeling adventure is highly recommended. Hop aboard on private boat through the islands on a large motorized boat locally known as a “banca”. This banca will take you a dip in the marine sanctuaries. While cruising, you can also head out onto the waves in the beautiful stops at these islets: Hilutungan, Olango, Pandanon or Nalusuan. Sailing through these beautiful places with marine sanctuaries and panoramic views and watching colorful tropical fishes through the clear waters is a must. This is a one spectacular experience that will leave you in awe. You can enjoy all these places while savoring a delicious grilled seafood lunch on the beach and enjoy free at your leisure. Al these things can be accomplished by getting a private boat trip. Then dine on a picnic lunch in your own rented banca. For private banca needs, it’s pretty easy to book at Cebu Mactan Island Hopping! How can we get you aboard on private cruise? Your Mactan island hopping journey begins in the morning at the dock of Baybayon Maribago. Your banca will be waiting for you to take in the views on a 30-minute ride. You can choose either of these islets – Hiluntangan, Olango, Pandanon or Nalusuan. You can also take stops at any of these or three islands. 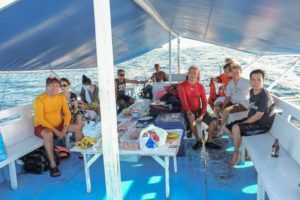 With the helpful and expert hands of Cebu Mactan Island Hopping owner and crews, your island hopping adventure will surely be an experience unsurpassed by another! Your choice of the island depends on the day you choose. Nonetheless, we guarantee both isles are equally idyllic and have the same sandy white beaches. Imagine getting up close and personal with all these marine lives that was only once found in National Geographic documentaries and tour brochures. What are you waiting for? Start your adventure now and book with us! Book at Cebu Island Hopping Tour to get that private cruise experience you’ve always dreamed of. Check our awesome cheap island hopping packages and prices here. I don’t believe I have been to Cebu just yet as I have yet to go back home to the Philippines in over 14 years. I have been to Boracay and I have heard from my parents that they like Cebu a lot better. I hope to go at some point within the next couple of years. thank you for the comment . I hope you can visit Cebu if ever you are here in the Philippines. Hello – I have never heard of the Island of Mactan, but it sounds very intriguing. I sure could use a vacation right about now. I tried getting more information about packages and pricing, but the link in your article was not working. Let me know when you have that up and running. thank you for the comment . my link is up and running, please check it out. This looks fun! However, I have some couple of questions. Where is Cebu and how can I get there? If I am to visit the place, will there be a hotel to check-in? Is it part of the package? Also, I click the link regarding the price but I think the link is broken. Can you give me a quote? What an awesome post and so very tempting. It sounds absolutely the best way to see the amazing underwater world and those white beaches sound fantastic. Island hopping sounds the perfect way to spend a holiday. There seems to be a lot of thought gone into this private cruise, having the food prepared for you makes it all so much more restful. The closest I have gotten to experience anything like this was when I was on a Caribbean Cruise and stopped off at Labadee Island and attended a barbeque and the amazing beach and lay in a hammock and relaxed. It was perfect. I have not experienced island hopping, and how I wish I were 20 years younger and would do this in a heart beat. This island looks amazing, really. The paradise on earth, like they say. I really want to visit it, but I’m afraid that it is overwhelmed by tourists. Or do I see it wrong? If I do, be sure we will book a travel to there very soon. I’ve always wanted to visit the Philippines and this article motivates me to look more into it. I was looking at your boat rental prices and your package prices, but I don’t know the conversion rates. What does the letter P mean before the number? and what is the name of your monetary unit so I can look up the conversion rate? The pictures of the area look amazing. I can’t wait to learn more! Hello, I have never heard about Cebu Mactan Island, after reading your post I am in love with this island. As soon as possible I will contact you to book a travel in Philippines and for sure the private cruise, I am sure I will have the best vacation in my life 🙂 I only want to know if there are sharks or other dangerous fish? We don’t have great white shark here, only whale shark . Hello. I am trying to decide where I want to go on holiday next year. I have never been to the Philippines. A day spend island hopping sounds very nice. The lunch sounds delicious and very filling. Pork, chicken, shrimp, rice and fruit. I am hungry now thinking about it. I will have to discuss this idea with my family. Thank you . Hope you can visit our place here in Cebu Philippines. You make me want to go right away. I’m not too far away, in Thailand but have never visited the Philippines. I’ll bookmark your site, my wife is asking to go to the Philippines for quite some time due to have some friends or family there. I don’t even know exactly where these Cebu islands are but it surely looks beautiful and very clean. Thank you . We’ll wait for you. This place sounds like a tourist’s dream. I have never heard of it. Can you tell me where is it located? I haven’t travel anywhere exotic in a long time. The last place was St. Thomas. This place sounds familiar especially when you mention the sandy white beaches. I am putting this destination on my bucket list. This seems like an awesome place for a vacation with my family. This is the first time hearing of this place. I would really enjoy the private cruise, but I think I need to save and plan towards this. I don’t really understand the prices though I need to do conversions. Thank you . Hope you can visit our place. Looks like a great place to go for a nice long week get away. I never been but I would love to leave New Jersey lol just to see the other side of the world . Have you ever been? If so how is the food and the prices out there I’m thinking maybe I can do this for next summer last summer I didn’t do much this here would be perfect for me and my boyfriend! Thanks for the article I enjoyed it! After reading your post I got the interest and urge to visit Cebu Mactan Island. And I added it to my list. And I will share your post with them and also when I visit them for sure I believe we will plan to go to Cebu Mactan Island. Thanks again for the amazing post! I have lived in the Philippines for over 20 years (I am British) and the beaches of Cebu are beautiful. There are not so many places in the world like this at a price that is affordable. Your pictures give a very small glimpse of what is available, but it is really a picturesque place to be. Local hospitality makes this a wonderful place to lie back in the sun with a margarita in your hands and let the world go by. Thank you for this article, it is really informative, I have always loved to travel around the world, visit places that are unique, after reading your post, I now know where to spend my Christmas vacation which is definitely cebu mactan island. Thank you for this useful post once again I enjoyed reading it. I will definitely share this site with my friends and family i believe they will find it amusing. I was in a conversation just yesterday with someone who is off to Trinidad for a month. I haven’t been on holiday for 6 years! It is definitely time. Island hopping sounds like fun, but I would choose somewhere nearer to UK where I live. Cebu does sound like an interesting place though and I am sure the food must be delicious! Island hopping sounds like the perfect holiday….Sun and sea! thank you for the comment. If you want to visit Asia please include Philippines! Hello, I just took a look at your site and I really like it. It is simple, direct and to the point. There are some minor formatting issues on the Home page where your text is not wrapping around the image correctly from the first paragraph. Not a big deal but it would read and flow better if this was corrected. Another suggestion I would have is to break up your long paragraphs into shorter ones. Again, this will help with the readability of the site content for your visitors. This could be done on all of your pages, not just your Home page. And one last thing, Cebu Island looks like a really beautiful place! But other than the main heading and 2 smaller photos (one being of people on a boat) you could really do well by adding some additional images that showcase the beauty of the island. You could either do this by adding a photo gallery of images or by adding background images to your pages. This would really show your visitors the benefits of booking a trip to such a beautiful place. Other than that, I think your good! Again, it was easy for me to navigate and understand right away what your site was about. Good job! The scenery in those pictures is amazing. I’ve never been to that part of the world but the water and weather looks pleasant. You said the choice of the island depends on the day you choose. Does this mean every other day the island changes or how does that work? Are these just day trips or can you stay overnight on the island? Hi Derek thank you for visiting my site. Only day trips available as for now. Cebu sounds like a great place. Where exactly is Mactan Island? From your comment section I gather it’s part of the Philippines? I’ve never been to any islands yet white sand beaches and crystal clear water. I think Cebu should be on my bucket list. Is the private cruise limited to a specific season or can I go on it all year long? Hi Philip thank you for visiting my site. You can have a private cruise any time of the year.Feel free to ask for any further inquiries. Really!!! This to me will be the perfect place for my vacation anytime soon, though I have never been to the philipiness but I have heard about Cebu city a couple of times, I love the city and I will like to go there sooner or later. I have some questions about mactan island. Are there good hotels around for tourists and is there any continental restaurant anywhere near the city? Thank you for visiting my site. Speaking of hotels, There are lot’s of international hotels here in Mactan island. 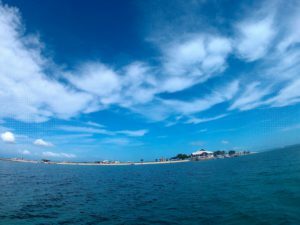 Was great to read this post about Cebu Island Hopping. Since I live in Australia I have been to the area previously and just loved it. It truly is paradise!! I’ll be checking back here for details next time I come your way which I am hoping will be next year. Thanks for inspiring me to go back again. I didn’t even know about this island, to be honest, I never visit the Philippines. You talked about water attraction, but are there any attractions on the mainland? Snorkeling is not one of my things, so I’ll probably enjoy only on the surface. When traveling in a new country, trying the local food is a must, what is the traditional dish? Thank you for the comment. Traditonal food here is barbecue pork or chicken . What a spectacular experience! Rest is so sweet after a long time of hard work ,so when you want to go for a vacation it is better to have it in an area where you are sure of having an unforgettable experience and ultimately get value for your money. I am sure Cebu island offers such a unique lifetime experience. Sea life is always exciting. Thanks for posting, but let me first admit that I had no clue about Cebu Island. As a result I was wondering where I would have to travel to in order to see this place. I read some comments in search of location information and I did find the answer in the end. Yes, it sounds exciting! I absolutely love the idea of the boat tours and I am of course drawn to the beaches and the food. Is there a special time of year that you would recommend for visitors? What is the climate like? Is it possible to state the prices in USD? This may be a pretty destination of mine this christmas, I have always love boat cruising and snorkeling from 2010 when I was still living in Beira, Mozambique before I relocated to Jahannesburg with my family. After reading your comprehensive review I am convinced that Cebu will give that memorable moments of a vacation ever. I have been browsing through Cebu Island Hoping Tour website packages, they are awesome, can’t wait for the day. Cebu Island really sounds like paradise, what a wonderful place to go for a vacation, I love the sound of island hopping and watching the multi coloured fish swimming in the waters as we go from one island to the next.Mactan looks beautiful the beaches are fabulous for a long walk or to go for a swim in the clear blue waters.I would like to see the exact location of Cebu on a map just to give me an idea on how best to get there. The Philippines is an island country and it would be a shame not to visit them. I spent a few days in Manila before and was amazed with the culture of the city. The beaches were splendid and wished I had stayed longer. Now that I know there are island hopping services like yours, I’ll certainly come up with a better plan for my next visit. Thank you for the comment Cathy! hoping you can visit Cebu. What a gorgeous way to view the islands. It looks so different from the farming country I live at. I’d love to go island hopping sometime. Copyright © 2019 Cebu Island Hopping Tour – Powered by Customify.